The Western Massachusetts town of Greenfield might be quaint, even a little sleepy, but it’s at the center of 23-year battle over whether a Walmart should be built in this community of 17,000. The bitter fight has included two developers, a town referendum, countless Conservation Commission and Planning Board hearings, lawsuits, and appeals that bring the case to the Supreme Judicial Court Thursday. The hearing at the high court will feature obscure legal arguments about which lower court should hear the case, meaning that the battle could go on for years more after the justices issue their decision. Walmart is widely believed to be the tenant for the proposed development, a retail space of 135,000 square feet, or more than two football fields. Lawyers for the current developer said they have no signed agreement with any retailer, but would consider Walmart. The project plans filed with the town, however, echo the style of existing Walmart stores; many Greenfield residents note that they look just like the Walmarts in nearby communities. The controversy dates to 1993, when a developer proposed a big- box store along French King Highway on the northern edge of town. Residents narrowly voted down the plan, fearing it would put Main Street merchants out of business and create traffic problems, all for low-paying retail jobs. The opposition was led by Al Norman, a Greenfield resident who made a national name for himself in the 1980s and ’90s by helping activists across the country oppose giant retail complexes. Norman, founder of the anti-big-box group Sprawl Busters, argued that operations like Wilson’s Department Store, a family-owned business and a fixture on Main Street for about 175 years, could suffer financially or be forced to close. 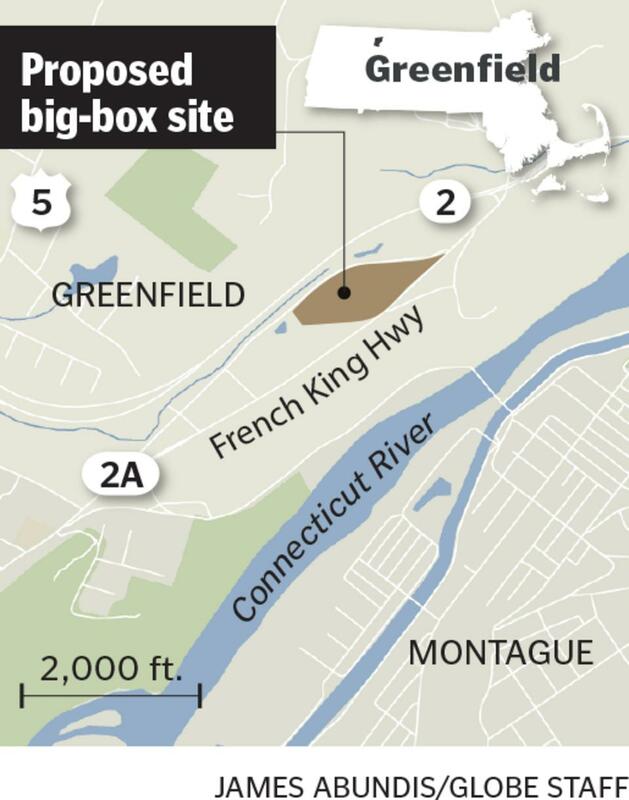 About 10 years later, a different developer, Greenfield Investors Property Development LLC, proposed another big-box store on French King Highway. Greenfield Investors is part of Ceruzzi Properties LLC, a New York real estate investment company owned by Louis Ceruzzi, a Connecticut development magnate who owns an $8 million summer home on Nantucket. In 2006, Norman said, Greenfield Investors received a permit from the Conservation Commission to build on a wetland at the site, which Norman and other residents contested. After two years of debate, the state Department of Environmental Protection overruled the Conservation Commission and forbade construction of a parking lot on the wetland. In 2011, Greenfield Investors reconfigured the site and sought Planning Board approval and a special permit, a requirement for any sizable project, which it won in a 4-1 vote. But seven neighbors filed a lawsuit in Greenfield Housing Court against the developer and Planning Board, claiming that construction would hurt property values and cause traffic problems. Greenfield Investors argued that the court did not have standing to hear the case, but a judge ruled it could go to trial. The developer appealed that ruling to the Supreme Judicial Court. Marshall D. Senterfitt, a Boston lawyer who is representing Greenfield Investors, said the housing court does not have jurisdiction under state law. The case, instead, should be heard in a special session of Land Court that decides large-scale development disputes, he said. Senterfitt, noting that Greenfield Investors filed its plans long after the unsuccessful 1993 development push, said the issues in the case have been obscured by an earlier history in which his client played no role. “Our client went through a very thorough permitting process and received approval after a significant amount of effort, and this [history] is somewhat of a distraction,” Senterfitt said. Thomas Lesser, a lawyer for the abutters, said the case could have been resolved if the developer had been willing to shrink the size of the proposed store — as many retailers are doing today. Greenfield residents on both sides of the debate are planning to make the 100-mile-plus trip to Boston to hear the Supreme Judicial Court arguments. Town Councilor Isaac Mass, a lawyer and founder of the pro-development group Citizens for Growth, has organized a bus trip for project supporters. They meet Thursday morning in the parking lot of the Greenfield Home Depot.